Savanna is a wonderful three bedroom bungalow tucked away off the main road and is presented in true move in condition. This superb family home has been immaculately decorated by its current owners to a high standard and boasts a beautiful sunny rear garden and has the scope to be developed further. 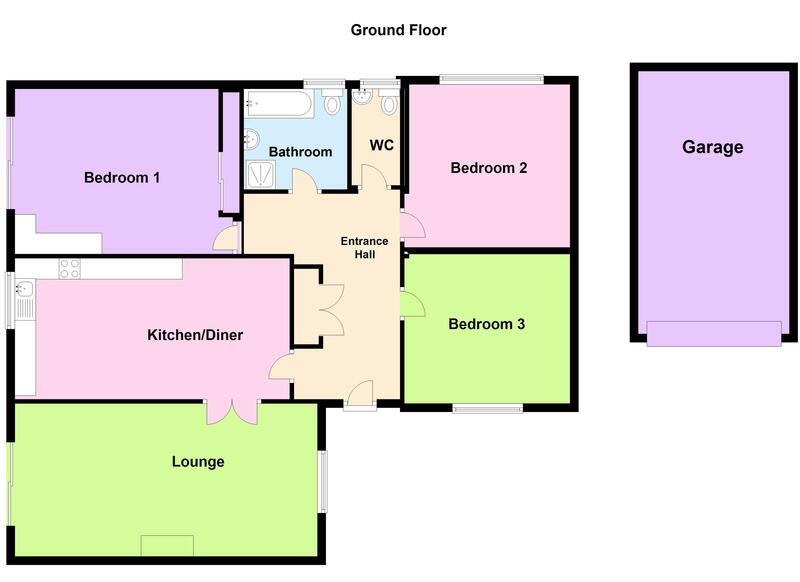 The accommodation comprises an entrance hall with a large storage cupboard, a bright and spacious lounge with doors leading onto the garden, a modern family kitchen, a well-equipped family bathroom, a separate WC, three good sized bedrooms and a detached garage to the side of the property. Savanna would make an ideal family home or an equally wonderful downsize property and early viewing is highly recommended. Call Cranfords today on 243878 to book your viewing. 18'2" x 8'11". Appliances include Whirlpool double electric oven with 4 ring hob and Whirlpool extractor fan, Hotpoint washing machine, Whirlpool dish washer and Hotpoint fridge/freezer. 15' x 11'4". Fitted bedroom furniture. 10'1" x 9'4". Fitted wardrobes.